Tires are far more important to your car than you may think. To a great extent, they control stopping, starting, turning, and smoothness of ride. They even make a great impact on you gas mileage. There are tires for every purpose. I strongly recommend using the proper tire to match the weather conditions and their use.Auto Insurance Companies, Governments and Industry are taking notice in the importance of tire safety involving accidents. In fact, Governments are starting to legislate laws, that require snow tires in the winter. If you ever driven in snow and ice you would know what I mean. In the last few years, Governments are looking into legislating installing electronic tire pressure monitors in the new vehicles. Tire pressure has a large relationship to tire failure especially at highway speeds. The quality of the tire makes a huge difference in your stopping power. Tires alone can account for a 25 percent difference in stopping distance. After the brakes is applied, tire friction against the road surface determines how far the car will slide before it stops. The development of the automobile has actually hinged on tire progress. The speed, power, and weight of modern cars would not be possible without adequate tires. At one time, a few hundred miles was a long life for a tire. Today, thousands of miles is normal. Modern rubber tires are more than just rubber with different compounds. They have a tough fabric and stiff steel reinforcement on the inside to give them strength. All of the tires components are put together on a drum vulcanizes or toughens the rubber into a solid mass that can resist pavement wear better than steel. The tire Tread rubber consists mostly of synthetic rubber and hardeners such as sulfur and carbon black. The tires tread enables the tire to roll smoothly over the pavement and to resist damage from road hazards and most important, to grip a variety of road surfaces as firmly as possible. Tread designs vary. For instance, a tire that grips especially well on wet pavement may not be a good tire on a dry pavement. You can choose treads for all-around use, for wet- gripping, or for mud and snow and ice- gripping. Constant slamming into deep chuckholes and over curbs will ruin even a new tire; so will driving on a flat. The bead of a tire is a strip around each edge that is shaped to hold the tire tightly to the rim of the wheel, and thus prevent air from leaking out between it and the wheel flange. The bead is made of loops of steel wire, which keep it from stretching from pressure and from the centrifugal force of rotation. Body cords are folded around the beads. They are made of rayon, nylon, polyester, glass-fiber, or other material. Each has its advantages. Rayon-cord tires are noted for their low cost and good ride. Nylon-cord tires usually give a slightly harder ride especially for the first mile or two after the car has been parked but offer toughness and resistance to road damage. Polyester and glass-fiber are new tire fabrics that bear consideration. Even steel is coming into use as a tire cord material; you can guess the toughness and impact resistance it offers. Belted bias-ply. This type is similar to the bias ply, except that the under tread area is reinforced with relatively stretch- free belts of fiberglass or steel. Two to six of these belts run the circumference of the tire, restricting tread squirm. 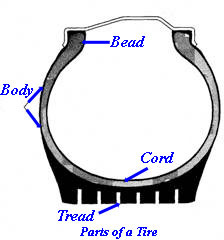 Thus, the tread of a belted bias-ply tire does not wear away as rapidly as that of a regular bias-ply tire. Belted bias-ply tires generally cost more than conventional bias-ply tires. They should be used in full sets, or at least in pairs across an axle. Bias-ply. A bias-ply tire has a body made of layers, or plies, of cords that run from one wire bead to the other at an angle to the circumference of the tire hence, the term bias-ply. There are either two or four plies in a typical tire. Alternate plies run at opposite angles to form a crisscross design. They are laid at cross angles between 300 and 38 to give rigidity to both sidewall and tread. Radial-ply. A radial-ply tire is belted, too. But instead of running on the bias, its body plies run from bead to bead at 90 to the tires circumference, much like the stripes around a zebra. That makes the tread rigid and the sidewall fiexib1e resulting in superior road-holding qualities. Radials also tend to give the longest wear but they are the most expensive type. Use radials only in sets of four. If you use rear-mounted snow tires in winter along with radials in front, buy radial snow tires. Mixing radials with non-radials is like wearing a tennis shoe on one foot and hiking boot on the other. You get different types of traction, which can be dangerous. A recent addition to tire designation is the series designation. Tires are called 60 Series, 70 Series, 78 Series, or 80 Series, depending on their profile, or cross-sectional shape. In a 70 Series tire, the side wall height, as measured from bead to tread, is 70 percent as much as its tread width. A 60 Series tire is lower and wider, while in a conventional (80 Series) street tire, sidewall height is about 83 percent of tread width. The higher the series number, the higher and narrower the tire profile. Because of differences in handling characteristics and in running radius, use 60 Series and 70 Series tires only in pairs on the same axle. Tire sizes can be confusing because they change with each new development in tire design. The new, wide-profile tires have different size designations even though they fit the same rims. For example, a common pre-1965 original- equipment tire, the 6.70-15, has been replaced by a wider tire, the 7.75-15. The newer bias-ply and belted bias-ply wide- profile designations for that tire are F78-15 in 78 Series, F70-15 in 70 Series, and F60-15 in 60 Series. The radial ply designations for the same size tire are FR78-15 in 78 Series and FR7O-15 in 70 Series. 15 Stands for Rim diameter in inches. This can be from 8″ to 28″ diameters. 102 Stands for load index. Different numbers correspond to different max. loads. This tire is rated for 1874 lbs. Many tires has this written separately on the tire along with the load capacity. T Stands for Speed rating. This tire is rated for 118 mph. There are different letters representing different speeds. Most tires doesn’t have this any more. There are many different Specialized tires, like the run-flat tires that has different designation numbers. There are many other ratings like tread wear, traction, and temperature resistance. When it comes down to buying you should investigate the differences. Before switching to different-sized tires, check the auto manufacturers recommendations. Never use tires smaller than those specified for your car. Usually, though, you can move up one, or some times even two, sizes to improve tire life, handling, and load-carrying ability. However, in some cars wheel well clearances or rim sizes do not allow a larger size. Again, check all the dimensions on your car before changing. Never put two different size tires opposite each other on an axle. In the front, that would affect wheel alignment and could cause the car to drift to one side. In the rear, it would strain the differential gearing because the larger wheel would make fewer revolutions than the smaller one in covering the same distance. When you replace just one tire, get one the same size as the others. Pair it with the best of the three remaining tires and use both on the rear axle, where the better treads will help traction. When replacing two tires, pair the new ones on the rear axle. Put the next-best tires in front and use one of the poorer ones as a spare. New tires need to be broken in (even the new spare put on to replace a fiat). That means driving at no faster than 60 mph for the first 50 miles. Normal city driving is a good tire break-in. Break-in allows the complex elements of the tire to adjust gradually and function as an integral unit. Tire dealers are required to have charts showing such facts for all of their tires, including load-carrying capacities at various inflation pressures. A brochure containing the same information is supposed to be given to every new-tire buyer. Perhaps worst of all, tire rotation may mask a misaligned front end, badly worn shock absorbers, or defective brakes. Such mechanical problems cause premature and uneven tire wear but you may rotate the tires before the uneven wear be comes obvious. When storing any tire, lay it flat on a clean, dry, oil-free floor. Keep it away from electric motors. Sparking motors produce ozone, a form of oxygen that deteriorates rubber rapidly. And store it in the dark; sunshine is hard on tires. There are commercially made Racks available for home use, to those that are changing tires often. ( Summer to Winter ) Some come with covers to help keep them clean. You will get more mileage and better service from your tires if you treat them right. Pressure. Most important, keep tires properly inflated. Too little pressure makes the tread scuff off at the shoulders or the outside. It also allows excessive flexing of the sidewall. That heats the tire body from inside and causes faster wear and even tire failure. Too much air pressure causes severe wear in the center of the tread. It also strains the tire body and makes it prone to damage by impact with road hazards. Your car owners manual should show a range of pressures, depending on the type of driving you do. There are pressure information on a sticker in most door jambs. Keep an accurate tire-pressure gauge in the car, and use it at least once a month to check pressures when the tires are cold. If adjusting pressures properly is a problem because you live more than a few miles from a place where you can get air, try the following: With your gauge, test one tire at home while it is cold, and make a note of its pressure. Then drive to the service station, and with the same pressure gauge, take another reading of the same tire. The difference between the two readings is the amount the pressure was increased by the warm up drive. Simply add that difference to the tire specifications and inflate the tires accordingly. For instance, say the trip to the station expands the air in the tire two psi. Add this difference to all your cold-pressure specs. If your manual calls for 23 psi in the rear and 26 psi in the front, fill the rear tires to 25 psi and the front tires to 28 psi. When the weather turns cold, tire pressures fall off, and must be boosted back up to the specified cold pressure to avoid run- fling under inflated. Every 100 temperature drop lowers the pressure about 1 psi. Tread. Check the tire treads often. Nails, small stones, and pieces of metal or glass embedded in the tread should be pried out. A tire that leaks should he removed and its inside inspected. Permanent re pairs should be done only from inside. Check regularly for tread wear. Tires that are worn below 1/16 inch tread depth are dangerous and should be taken out of service. Tires of recent make have built-in tread-wear indicators bars of solid rubber that appear across the tread when the tire has only 1/16 inch of tread remaining. When the tread-wear indicators contact the road in two or more adjacent tread grooves and in three intervals spaced about 1200 apart around the tires circumference, that tire should be replaced. Tires without tread indicators should be measured in two or more adjacent grooves and at three locations, about 120 apart, around the tire. You can gauge 1 easily with a Lincoln-head penny. Place the penny on edge in a groove, with the top of Lincons head pointing into the tread. If the top of the head is out of the groove in several spots around the tread, the tire needs replacing. 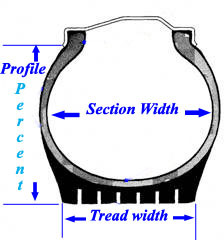 For more precise measurements, buy a tread wear gauge (about $1). Such a device shows you which tires are wearing fastest, and whether the wear is even or spotty. If the front tires are wearing considerably faster than the rear ones, your car probably has a wheel alignment problem. Valves. Tire valves, valve cores, and ex tensions should be in good condition. Valve stems should have valve caps that are screwed on finger tight. You need at least one metal valve cap that is designed for removing and replacing valve cores. If the special cap cannot be on the valve stem, keep it in the glove compartment. About every other tire change, you should change the valve. Snap-in replacement valves for tubeless tires are carried by tire dealers and are lubricated so that you can pop them into the wheels valve opening. The replacement should match the original in length and in TR number (molded into the valve base). Whitewalls. Some whitewalls come from the factory with a colored protective coating on the white portion. That coating should be removed before you use the tires, since it is not as flexible as the rubber and tends to crack, causing the sidewalls to check. In no case should a whitewall be driven more than 50 miles without re moving the coating. To get it off, wet the tire surface thoroughly with warm water, let it soak for a minute, and then wash off the coating with a soft-bristle brush or a sponge. The coating can also be removed in a jet-spray car wash by close jetting. Never use gasoline or other petroleum solvents or a wire brush. Road dirt that collects on whitewalls should be removed only with soap or a nonabrasive cleaner and, when necessary, a soft-bristle brush. Oil-based cleaning fluids, gasoline and kerosene deteriorate the rubber and may discolor whitewalls. Insurance companies and Governments are becoming aware of the importance on the use of snow tires. They give a shorter stopping distance and greater maneuverability, which in turn, reduces accidents and injuries. Winter tires are a different breed. They are designed for a specific purpose, winter. They are designed for snow and ice, sometimes more of one than the other. Your best bet would be to check with your local dealer, what is available, to meet your needs. It is not only the snow you have to worry about, its the temperature drop. In, around 7 Degrees Celsius, most tire compounds become stiffer and doesn’t conform to road surfaces as well. This tells you, it would be a good idea to put on your winter tires. Winter tires are not only designed for these lower temperatures, they have the tread patterns most suited for snow and ice. They also has the rubber compounds and sipes for the job. Sipes are the little cuts in the tread pattern that helps deflect some of the water picked up. Winter-specific tires will outperform even the best all-season tires when the temperatures drop. Studded tires will help on ice but they can be very noisy. A lot of areas ban these on their roads except for special circumstances. They can tear up the payment among other things. They are recommended to install only after the snow flies. Winter tires usually have a mountain icon imprinted in the sidewall. Winter tires should be removed as soon as the weather clears up. The same compounds that give winter tires its advantage will heat up and wear prematurely in the summer. They will give a spongy feel to the drivability of the vehicle on dry pavement. I would recommend having a complete different set of steel rims with the snow tires on them and balanced. This can be a little pricey but you would save on mounting and balancing costs in the future. It would also save on some deterioration on your alloy wheels, if you have. Put some wheel covers on them steel rims to enhance the looks and protect the lug nuts of the wheel assembly.